A rectangular, plane, single turn coil ABCD of length 2ℓ and breadth ℓ is arranged as shown, with the plane of the coil in the XY plane. O is the origin of coordinates and the side AB of the coil is along the X-axis OX such that the X-coordinate of the side DA is 2ℓ. A Magnetic field acing in the negative Z-direction and of magnitude B = K/x where K is a constant and x is the x-coordinate, acts in the entire region of the coil. (a) Consider a strip of the area (of the coil) parallel to the side DA at distance x from the Y-axis (fig. ).If the width dx of this strip is small, the magnetic field over the entire strip can be assumed constant (equal to K/x). The magnetic flux through the strip is (K/x) ℓdx, since the area of the strip is ℓdx and the magnetic field is directed perpendicular to the plane of the strip. The total magnetic flux (Ф) through the entire coil is obtained by integrating the above flux between the limits 2ℓ and 4ℓ. (b) When the coil is rotated through 180º, the magnetic flux linked with the coil changes from Ф to – Ф so that the change of flux is 2Kℓln2. (c) When the coil is moved in the positive X-direction, maintaining its plane in the XY plane, the flux through the coil decreases. Lenz’s law demands that this decrease of flux is to be opposed. Therefore, a current is induced in the coil so as to produce a magnetic field in the negative Z-direction, thereby trying to increase the flux. Applying the right hand palm rule, we find that the induced current must be clockwise. 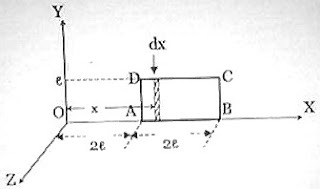 (d) If the coil is moved in the positive Y-direction, maintaining its orientation in the XY plane, the flux through the coil is the same in all positions. The change of flux and hence the induced emf is therefore zero. (e) The magnetic field given in this question is of the form B = μ0I/2πr, which is the field produced at distance ‘r’ by a long straight conductor carrying a current I. 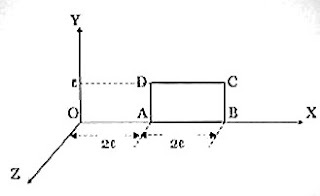 The straight conductor must be placed along the Y-axis and the current in it must flow in the positive Y- direction.